I have a whole list of updates and a painting to give away. But first, I've written a little autobiography about the time when I lived on a sailboat in Fly Creek Marina. If you're in a hurry, click here to skip to the end. Sleeping beneath the hatchway, I can still see the constellation Orion as the first rays of morning pass Bermuda, touch Florida, sail along the gulf coast to Fairhope Alabama and wake the sleepy marina. I roll out of my bunk and put the kettle on, flip a switch in the pilot house and a mix tape from Jenny plays Reggae Mishka throughout the cabin. I sit on deck while the oatmeal steeps and and sip my coffee.The marina's awake, mullet churning the water, pelicans diving. One catches a fish and I clap politely. It's all very peaceful and respectful of the quiet hour. 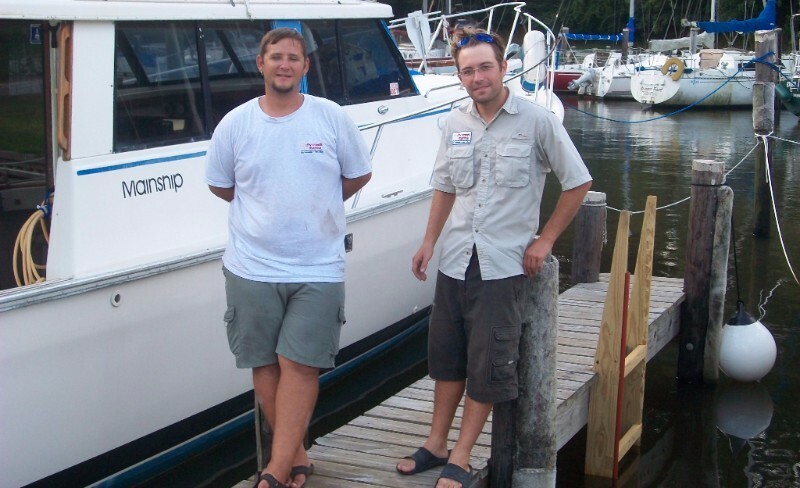 Then Brandon rolls up in his Toyota Tacoma and throws open the doors of the boat building. I remember that I also work at the marina. I throw on yesterday's work clothes and stagger over to help him and John put power boats in and out of the water for eight hours. I live less than a hundred yards from work but somehow, I am still late. I meet great writers at work, artists, businessmen. They all like to fish, love being on the water. I drive their boats to the fuel dock and back, carry their coolers and help them cast off. Lunchtime, I cook up some vegetables that I brought home on the bicycle. (I don't have a car at this point.) All of my meals are simple. I forget to add seasoning because life is interesting enough. After work the boaters congregate on the docks just long enough for the news and a beer. Some of them will keep on into the night, drinking, playing guitar and singing loud enough to scare off the pelicans. Some nights I bike half an hour to a Jiu Jitsu class and practice until dark. This night is an art night. I've got it in my head that I want to be a painter and so I bungee a few paintings on the back of my bike, ride up to Windmill Market and put them on a display rack I've rented. Sometimes I've sold one and there's a check for twelve dollars waiting. I buy twelve dollars worth of groceries, put the paper bag in my bike basket and ride to the Art gallery. I'm lucky to have stumbled across a group of painters, potters and musicians who get together for "art night." There aren't any rules for art night. Sometimes Zach brings a pottery wheel, sometimes Rufus is playing guitar. Most people are drawing or cutting shapes out with scissors, spray painting outside or making snacks. It's a family thing and friends are in-and out, saying hello, dropping off pizza. Dennis shows up with a Didgeridoo. Strangers stop to look inside. I sit on the floor. Jenny and I aren't dating yet, but she meets me here and helps to paint fish. It goes until well after midnight. Jenny heads home. Everyone drifts off until it's just a few of us. Coffee has worn off, snacks run out, even the dog has gone to sleep. I'm still the new guy so I say goodbye to Duane and the others. The die-hards are still intently painting. They'll be up until morning creating masterpieces. But I have my little paper bag of turnips and tomatoes. I speed through the empty streets of Fairhope on an old recycled ten-speed, feeling the cool on my sun-burnt face as I coast down the three hills between Fairhope Ave and Fly Creek Marina. As I'm climbing onto my boat, a great blue heron screeches and I nearly fall into the water. He was trying to fish and I chased him off. I apologize and he lands on a piling on the other side of the water and just sits there, giving me the stink eye. He watches me for a while as I unpack my groceries and make myself another tea. Eventually he goes back to work. The wind blows lightly. Ropes tap against the masts and my world bobs up and down under the stars. I check on Orion one more time. He's up there, just above Robertsdale. Jenny's texted me and we make plans for the weekend. Orion's aiming that bow westward, toward Mobile or New Orleans. Maybe he's pointing at Ocean Springs. I'm in no hurry to find out. I'm on boat time again, moving real slow. The future is glowing, but I'm in no hurry to get there. In a way, it's like I already am there. And that could be because I am there now. It's 2016 as I write this. Jenny and I live in Ocean Springs. And it's all pretty glowing. I'm still on boat time, moving real slow. One thing melds into the next. 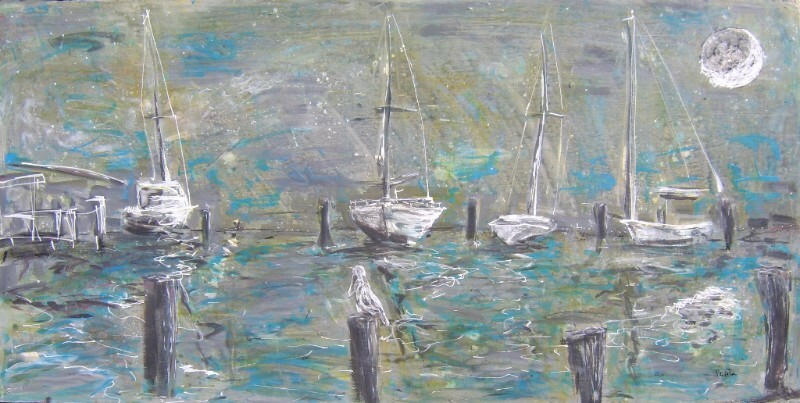 The art life is moving now, it's gained a sort of momentum all it's own with an ebb and flow that feels much the same as the tide I used to bob around on with the boat. 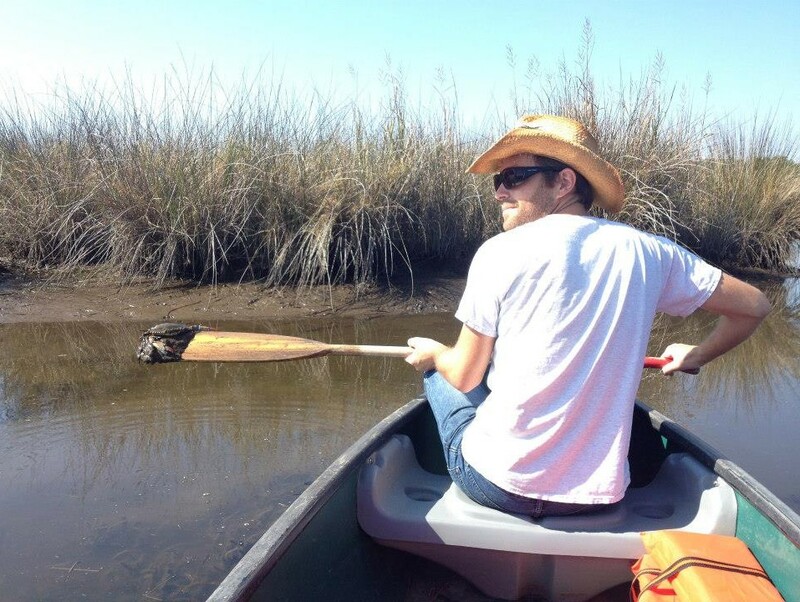 I don't miss the boat, or Fairhope, or that time when I was poor, bare-footed and starry-eyed. In a way it exists outside of time and space. In a way it had more to do with being in the present, and the nice thing about being in the present is that it never goes away. It's there every time I pick up a paintbrush or put words to a page. And that's what my art is really about. Art is my new boat-time. It's the ebb and flow of the tides. I don't know why you would read my books, or why people collect my paintings, but I would hope that they do it for the same reason I do: because art is living, and life is art and the more you appreciate one, the more beautiful the other becomes. So as we go through this journey, I hope that we can experience it together. I don't always do a great job of keeping friend and art lovers int he loop. Ifacebook a little. I publish a new book from time to time. I've just started to Etsy again and the shop there has the feel of a mini-creative space. I'm still active at all of the real, physical galleries. Once every couple months I stop in and change out art. I teach classes at the Mary C in Ocean Springs. And at least once a week I'm in Fairhope doing a little upkeep at the old marina. That's what I'm doing. And It's so hectic that I can't always keep in touch with people. But I hope you'll keep in touch with me. Let me know what you are doing from time to time. If I share a painting that you enjoy, tell me about it. These posts and emails are my new Orion. Each human connection is a star in a constellation that I look to for connectivity and perspective. And if you know anyone who would like to keep in touch with me and tune into my work, send them to this page where they can sign up for the newsletter, because times change, lives change, but our email addresses stay the same. I got the idea for these 3 inch by 24 inch paintings from a fellow sailor who kept a painting of this size hanging on his mast. 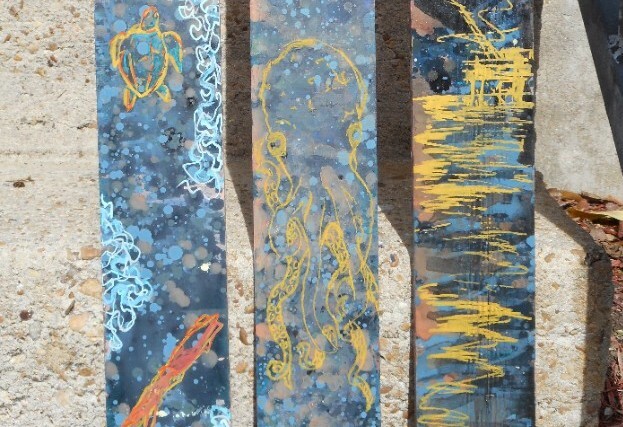 With this new series I'm back to the basics with bright colors and funky ocean life. I'm still painting lighthouses and oil rigs, but I'm putting more life into the scene and my art is getting looser and less serious, which is very freeing. I've had so much fun with the masthead paintings that I've taken the same dimensions and expanded them to make four-foot-tall, one-foot-wide canvases. They inspire the same, tableau layout, but there's more freedom. By giving up horizontal space, I don't have to worry about layout anymore and I can just focus on the content. List of upcoming markets. Put these on your calendar if you're in the area. Sat March 5 Is Ballyhoo, a larger, outdoor festival put together by GCAA. 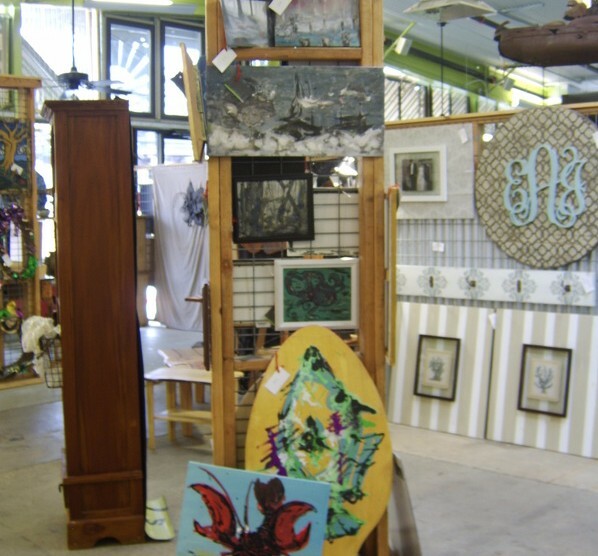 Thurs March 10th is Mobile Art Museum's night market. This is held inside of the museum. While you're there you can explore the museum and eat at the food truck out front. 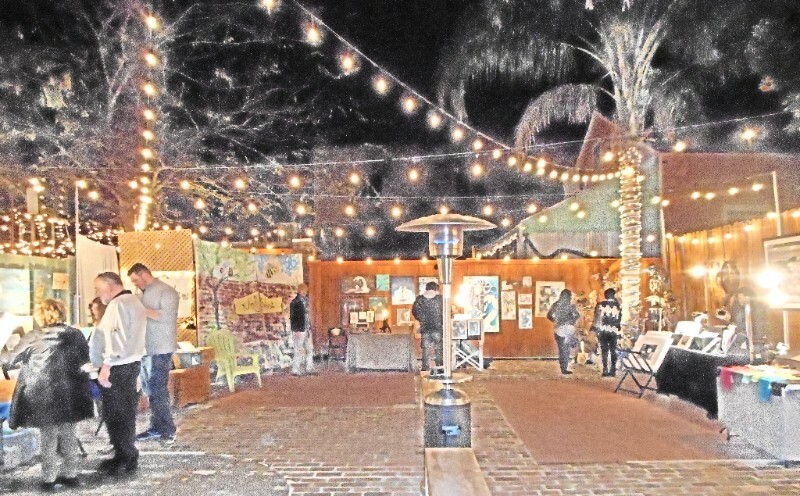 Most exciting for me is theArt Garden on Frenchman Street, New Orleans. They have a great venue and a relaxed atmosphere with top notch artists. I don't plan my trips far in advance, but if you're going to be in the city send me a message and I'll let you know if I'm there. 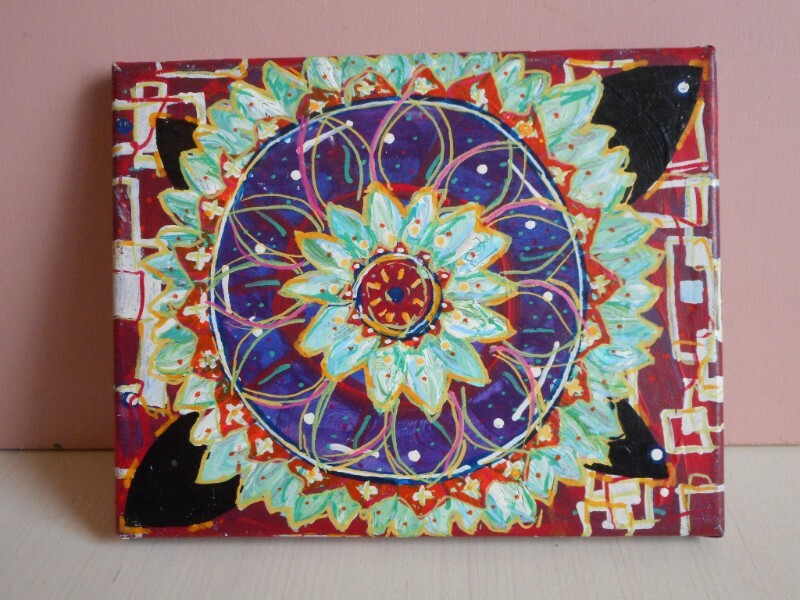 I'm giving away another painting. This 10x8 lotus painting doesn't quite fit with the rest of my work.It's not going to sell, but I can't quite bring myself to part with it. So I'd like to find it a good home. All you have to do is go to facebook.com/portapoetry and share any post from my art page. I'll record the names of people who share and draw one from a hat. The winner will get the painting. That's it for this quarter.